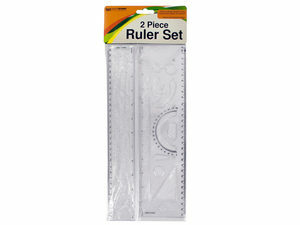 Great for home, school or office, this 2-piece Alphabet & Number Stencil Ruler Set features durable plastic rulers with stencils of numbers, upper and lower case letters, symbols and geometric shapes with a protractor in an easy to use transparent design. Rulers measure approximately 3.5" x 12.5" and 2" x 12.5". Comes packaged in a poly bag with a header card.